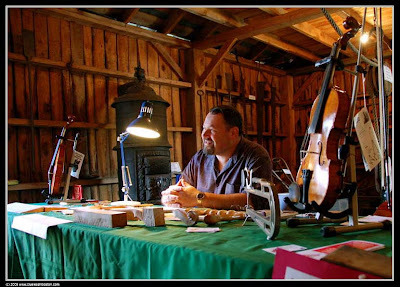 Fiddle maker at the Tunbridge (VT) World's Fair. He sure looks like he enjoys his work! Wow. There's a dying art. Great picture. Great shot- he just lights up the shot! Looks like a shop I'd enjoy visiting. Reminds me of many (many) years ago when I'd watch an instrument repair man work while I sat and waited for my trumpet lesson to begin.